Groucho, Gummo, Minnie (mater), Zeppo, Frenchy (pater), Chico, et Harpo, tempore Fun in Hi Skule, Fratrum Marx actus anni 1913. Fratres Marx fuerunt fortunati comoediani fraterni qui in vaudevillia, ludis scaenicis, pelliculis, et televisione apparuerunt. Fratres Marx, Urbe Novi Eboraci nati, fuerunt filii Iudaeorum advenarum e Germania. Mater, Minnie Schönberg, e Dorno in Frisia Orientali venit; pater, Simon Marrix (recentior Sam Marx appellatus, agnomine autem Francicus), natus est in Alsatia, nunc pars Franciae, et textor laboravit. Familia in parte Yorkvillia in Latere Superiore Orientali Urbis Novi Eboraci habitavit, inter vicinias Hibernianam, Germanam, et Italicam. Fratres Marx, a summa caterva: Chico, Harpo, Groucho, Zeppo, anno 1931. Skidoo (1968), divulgata a Paramount. 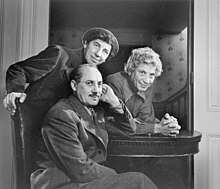 Tres fratres: Chico, Harpo, Groucho (sedens). Yousuf Karsh photographema anno 1948 fecit. ↑ "Mrs. Minnie Marx. Mother of Four Marx Brothers, Musical Comedy Stars, Dies." New York Times, 16 Septembris, 1929. ↑ "Chico Marx, Stage and Film Comedian, Dies at 70; Oldest of 5 Brothers Took Role of Italian Piano Player. Team Business manager." New York Times, 12 Octobris 1961. ↑ "Harpo Marx, the Silent Comedian, Is Dead at 70; Blond-Wigged, Horn-Tooting Star Scored on Stage and in Films With Brothers Harpo Marx, Silent Comedian, Dies." New York Times, 29 Septembris 1964. ↑ "Groucho Marx, Comedian, Dead. Movie Star and TV Host Was 86. Master of the Insult Groucho Marx, Film Comedian and Host of 'You Bet Your Life,' Dies." New York Times, 20 Augusti 1977. ↑ "Gummo Marx, Managed Comedians." New York Times. ↑ "Zeppo Marx Dies on Coast at 78; Last Survivor of Comedy Team; 'Tired of Being a Stooge.'" New York Times,1 Decembris 1979. 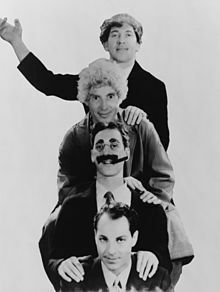 Crichton, Kyle, The Marx Brothers (1950) Doubleday & Co.
Marx, Groucho, The Groucho Phile (1976) Bobbs-Merrill Co.
Dwan, Robert, As Long As They're Laughing! : Groucho Marx and You Bet Your Life (2000) Midnight Marquee Press, Inc.
Gehring, Wes D., Film Clowns of the Depression (2007) McFarland & Co.
Marx, Bill, Son of Harpo Speaks! (2007) BearManor Media ISBN 1593930623.